The Mitzvah Journey – the next step to the now popular "bar/bat mitzvah project"
1.) Bein Adam L’Makom: The personal relationship between the individual Jew and God indicates that some mitzvot are personal. These might include ritual spiritual mitzvot like wearing a tallit or tefillin, developing a habit of daily prayer, or they might include gathering family stories. 2) Bein Adam L’Chavero: The communal component will be expressed through voluntary work in the Jewish community. That community may be our synagogue or it may be in the larger Jewish world. 3) Bein Adam L’Olam: Our faith also extends to our work in the world at large. God is, after all, the Sovereign of the World. Work in this segment of the mitzvah program might be to encourage recycling, work to promote peace, or to volunteer in our local area to improve the quality of life. 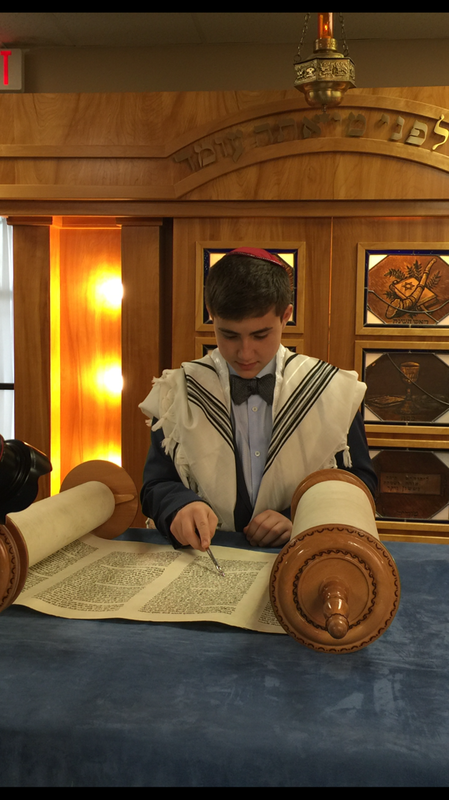 In preparing for my Bar Mitzvah I decided to fulfill several Mitzvot. I visited a senior living facility and spent time with my great grandfather’s cousin, Bette, who lives there. She was very grateful. I also helped my family build a Sukkah at our home and had the opportunity to shake the Lulav with the Etrog and say the blessing. We prepared blessing bags filled with essentials in a ziploc bag and keep it in the car and when we see a homeless person on the corner we offer him or her a bag. I feel pride to offer the blessing bag. I also read about the requirements of hanging a mezuzah and performed the Mitzvah of hanging a Mezuzah in our home and reciting the prayer. Also, I feel very lucky because my Papa Joe gave me his Teffilin and I had the opportunity to wear his Teffilin as another Mitzvah. I also performed several Mitzvot with my Cousin Liora. As part of my Bat Mitzvah, I completed mitzvot in 3 different categories. In the first category, Jewish Identity, I did several things. I learned how to bake a challah and I even got one of my friends to help me. I also go to services every Saturday and celebrate all the Jewish holidays. This winter break I had the amazing opportunity to go to Israel to celebrate my cousin’s Bat Mitzvah. Half of my family lives in Israel, so it has a very special place in my heart. I love to be in Israel and happy that I could go there as part of my mitzvah projects. In the next category, Jewish community, I did a lot of mitzvahs, such as helping to pack food at the Kosher food pantry with Young Judaea. I also did many things in the last category, Tikkun Olam (repairing the world). When I was in Israel this summer, I planted a tree in honor of my Bat Mitzvah, and I also attended Relay for Life to find a cure for cancer. We performed several mitzvot together. Kesher B’yachad was a big fundraiser we organized. Our favorite place in the world is Camp Judaea, so we wanted to raise money for someone to get a scholarship to go to camp. We sent out letters and emails to our camp friends to help raise money. We hope to raise enough to let a kid go to Camp Judaea. We also made Mishloach Manot and brought it to an assisted living home, called the Imperial Club. Our Savta Tsafra volunteers at the Imperial Club and our great-grandfather lived in the Imperial Club. We love to help out there as much as we can. We also went gleaning with CSK to collect food for people who do not have any. We also donated money to the Jacobson Food Pantry through Kayla’s Bountiful Arrangements. Finally, one of our favorite projects was a challenge to collect 180 mitzvot. We advertised on Facebook, through emails, and even went around and asked people in person to do a mitzvah. We wanted to do this to spread happiness and kindness. We are overjoyed with all the kindness that is spreading through the community. I have attended Shabbat Services with my family to pray since I was a little kid. We light candles, make our own challah, and have Shabbat dinner every week as a family--even when I am at hockey tournaments! I attended Donna Klein Jewish Academy for 6 years. We have been to Israel 6 times as a family, and we always visit with the brave soldiers of the IDF (Israel Defense Forces) every time we are there. We go see them on their base, and thank them for their commitment to the State of Israel. We also support the soldiers by donating scholarships for them to go to college. My parents taught me v'shinantam l'vanecha, "you shall teach your children." We observe all of the Jewish holidays as a family and always have lots of people over for Passover, Chanukah, and Rosh Hashanah! This helps create a kehillah kedosha, which is a holy community. Finally, my dad and I just checked all of the mezuzahs in our house, and I helped him hang the ones that were missing or broken. I am proud of my Jewish heritage and love celebrating with my family and friends. My dad and I went to Joe DiMaggio Children's hospital to visit and do an art project with the kids who are too sick to leave the hospital. You can bring crafts, and play and interact with the kids who are there for a long time. They don't have a lot of kids that visit them. This is part of Hakim takim imo, which means "you shall surely lift up with him" and Bikur cholim, "to visit the sick." It is important for us to remember that there are people who have long-term illnesses, and that we should not forget them. I will be donating two baskets of food, courtesy of Kayla's Bountiful Arrangements, to the Jacobson Family Food Pantry, which provides food to over 400 needy families and people of all ages. This is called Arevut, which is the concept that Jews have a special obligation to other Jews by encouraging commitments of aid and devotion among Jews.